The Jersey shore's favorite family beach! 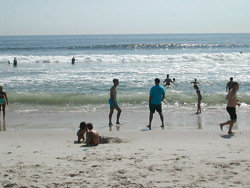 Point Pleasant Beach and Point Pleasant, New Jersey are often thought of as one large beach community by many summer visitors. The borough of Point Pleasant Beach boasts a wonderful Atlantic Ocean beach, along with the boardwalk and its amusement areas. The more residential Point Pleasant offers a wider variety of stores, restaurants, and services that you can find in Point Pleasant Beach. Point Pleasant is also bisected by the Point Pleasant Canal, which connects the north end of Barnegat Bay with the Manasquan River. Most people visit to spend time at the ocean beach. Here you can find out about the numerous beach management units, when the lifeguards are on duty, where to get your beach badges and how much they cost. Here you can look out over the Manasquan inlet, visit Jenkinson's amusements, see the marine life at the aquarium, eat a meal, access the beach, and more. Hotels, motels, house rentals....there are many options for finding a place to stay in Point Pleasant and Point Pleasant Beach. There are a number of fine restaurants and many more places that serve simpler but good food. Whether you want a seafood dinner, pizza, sandwiches, are some ice cream you can find whatever you need to eat for you and your family. There is more to Point Pleasant than just the beach! There are a number of big events in the summer, like the Seafood and Craft Festival in September. Many photos found on this page were used under a creative commons license - with thanks to cheese roc for the amusement ride photo and askjoanne fo rthe beach and ticket booth scenes. Permission was granted to use the copyright protected image of the river by this panoramio poster.